In this article I review Jetpack Premium, one of the paid Jetpack plans. The review is for people with a single site who have a small annual budget and who need to have support available. Now, if you have a high traffic site, an ecommerce store, or a membership component, then chances are that you have specialized needs and the information in this article may not apply. For years, the ‘go-to’ answer was to use a backup plugin and a security plugin combination. UpdraftPlus and BackupBuddy were popular backup options. For a security plugin, iThemes Security or WordFence were the ‘usual’ suggestions. I recently looked at pricing and noticed that combining a popular security plugin with a popular backup plugin may no longer be the most cost-effective option. Looking at backups, UpdraftPlus premium is $70 a year and BackupBuddy is $80 a year. 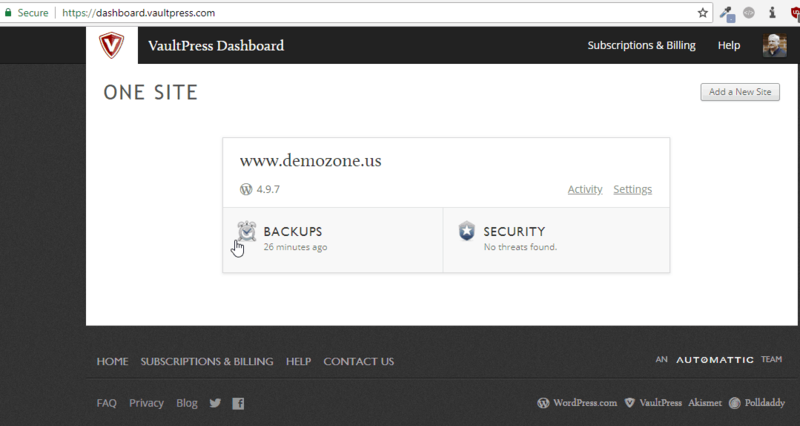 In terms of security plugins, iThemes Security Pro is $80 a year and WordFence premium is $99 a year. Take note, that sometimes these companies have a sale and UpdraftPlus has a renewal discount, but when you combine a premium backup and a premium security plugin, you are looking at around $150. f you have a single website, you might find Jetpack as a more cost-effective solution. JetPack was originally created for WordPress.com accounts because these were not allowed to use plugins from the WordPress.org plugin directory. WordPress.com is the hosting site run by one of the founders of WordPress. Jetpack provided common functionality that is missing from WordPress core that people on WordPress.com wanted. Let’s look at the JetPack options. Jetpack is installed as a single plugin, but it is really a suite of functionality rolled into one. Jetpack is also the connector to services available on WordPress.com. 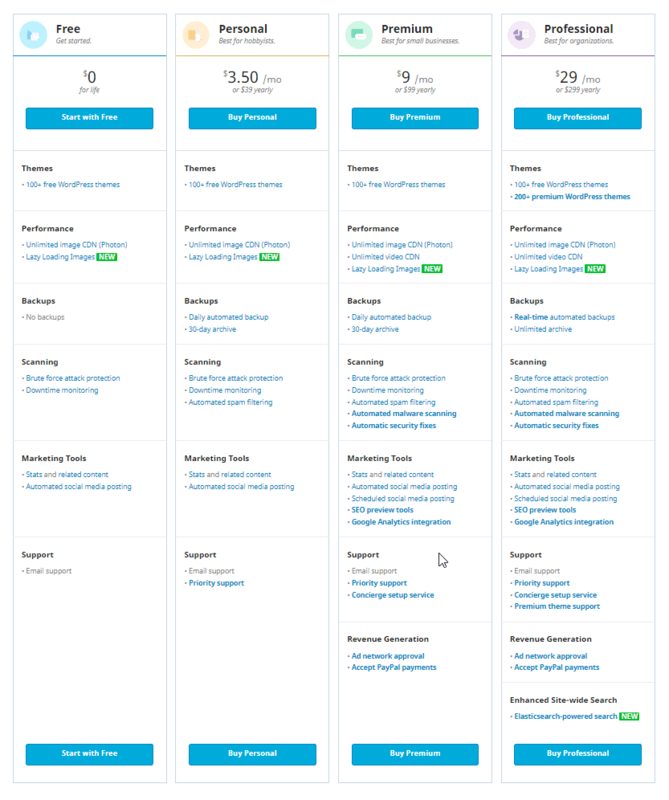 These are services that run off the WordPress.com platform. Bottom line, with Jetpack you are getting a host of features that you can enable or disable. Jetpack comes with a free tier in addition to 3 paid tiers. Each tier adds functionality. The free tier comes with network-based brute force protection of the login form. That includes limiting the number of login attempts to foil bots trying to guess the password, as well as network intelligence such as when one visitor is found to be a bad-actor on one site, it is banned on all sites using Jetpack brute force protection. The free tier does not include any backup option. Akismet free version is available in the WordPress.org plugin directory and adds spam protection, but has some usage limits. They do not show it on the pricing table, but two-factor authentication is also available for the free tier of Jetpack. 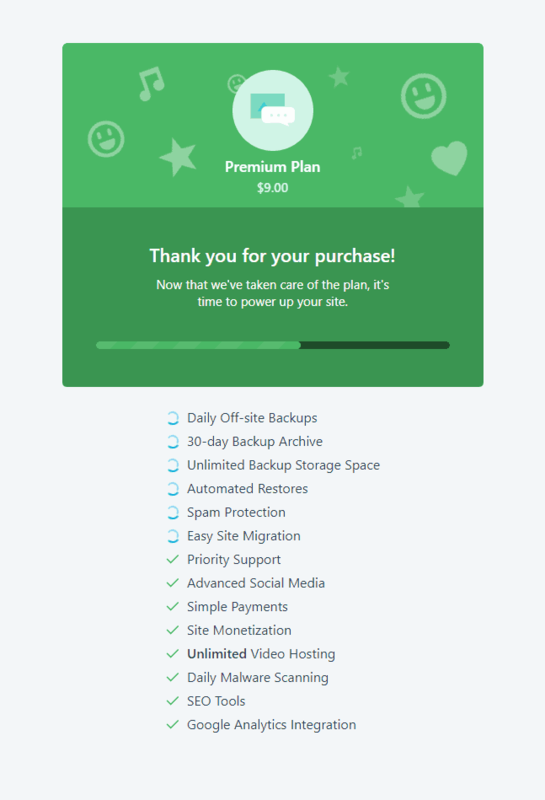 The Personal Plan is $39 a year, includes the options in the free plan as well as anti-spam protection (Akismet without usage limits), and automated daily backups. $39 a year for a backup solution is very competitive. Recall that UpdraftPlus is $70 and BackupBuddy $80 a year. The Premium Plan is $99 a year and includes the options in the free and personal plans as well as anti-spam automated malware scanning and automatic malware fixes. There are a number of other features, but focusing on security and backups, these are the main ones. The brute force protection requires no fiddling with security settings. It is a turn on and forget service. The anti-spam Akismet service requires that you enter a key. For the free version of Akismet you sign up and get a key. For the paid plans, the key is found on your WordPress.com receipt page. You setup two-factor authentication through a three step wizard and the process requires a mobile phone. In addition to logging in using your WordPress.com account, you enter a code that you get on your phone when you log into your website. A big plus in the Premium plan is the malware scan and especially the cleaning. I asked Jetpack support about the malware cleaning service, and was told that they will clean up the files for you if they are accessible, or they will help guide you if the things that need to be fixed are not accessible to them. They do this using the credentials you give them for VaultPress (discussed below) for file access. Steps needed within the WordPress admin, if any, I assume you would need to take as per their instructions. 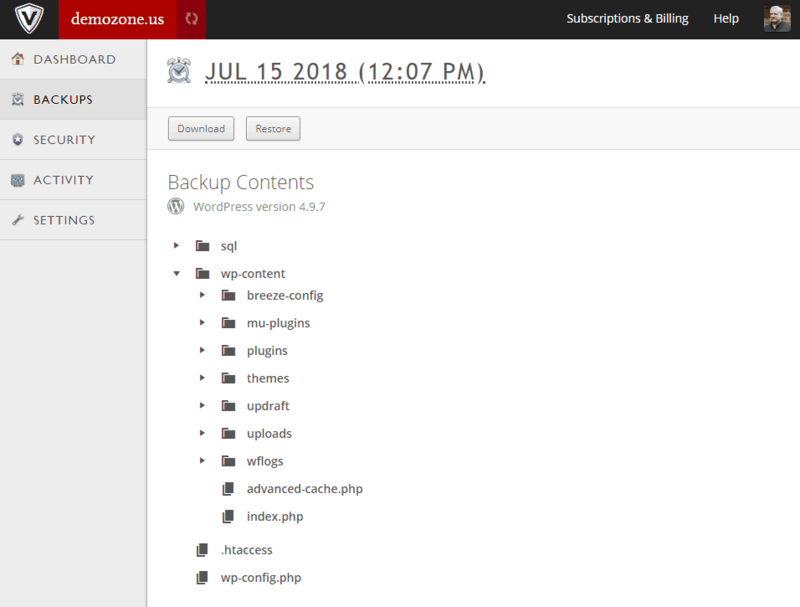 I was pleasantly surprised when viewing a backup to see that I could view the database tables, individual files and folders, as well as the wp-config.php file and the .htaccess file. You can download the database tables or file folders individually. This is a nice feature if, for instance, you want to retrieve an older version of a theme or plugin after an update. 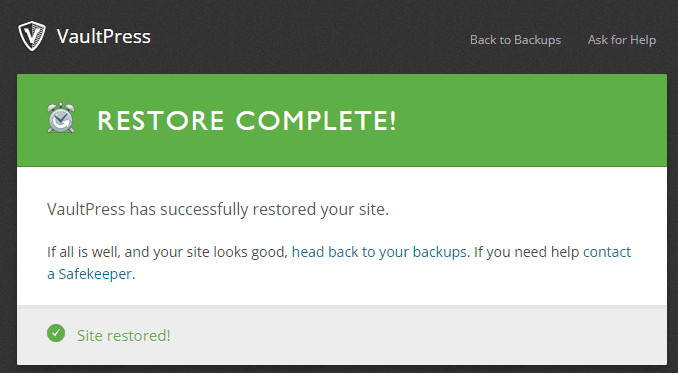 To test a restore, I entered the SFTP credentials for the site and clicked on the “Restore” button. The restore was very fast. I’ve contacted support for the free version of Jetpack. I got a response in about a day and the response was from someone knowledgeable and helpful. I contacted support a few times while testing Jetpack Premium and the response time was around 2 to 3 hours, even on weekends. For some of the features, such as backups, there is the option to mark the support request as an emergency, which presumably would result in a faster response. Also, when you sign up for the Premium plan you get a concierge meeting so that you can make sure that things are setup correctly. Although I focused on security, I also looked at a few of the other Jetpack features. You can choose a from a bunch of free themes. These are a curated list of free themes available in the WordPress.org theme directory. There are also some premium themes, but you must be subscribed to the Professional Plan to access them. The Premium and Professional plans also come with some SEO tools. These are limited to site-wide settings, which is useful, but does not include on page SEO tools when you create content, so this won’t replace an SEO plugin if you are a blogger or regularly producing new content. The free Jetpack plan comes with the ability to post your articles to your social media accounts. 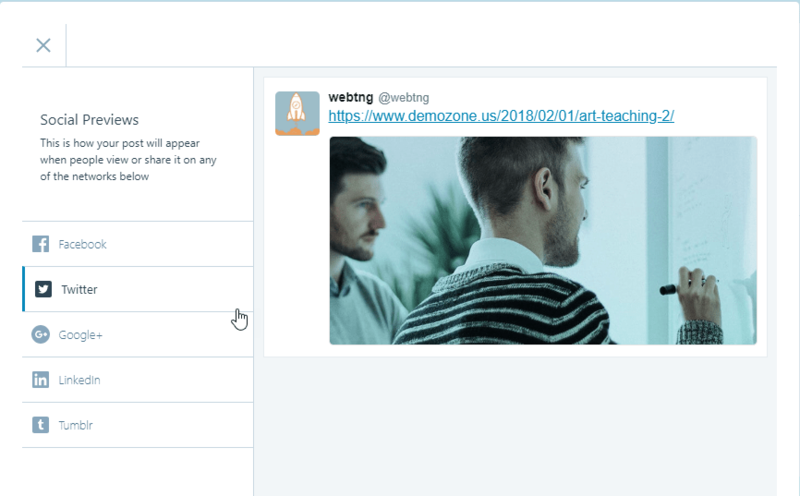 The paid plans add the ability to schedule posts to social media and preview them. I’ve found that being able to preview is important and I was pleased to see that the Twitter preview was accurate. In addition to an image content delivery network (CDN) that hosts your images, the Premium plan comes with a CDN for unlimited video hosting. I gave this a quick try and it works well. Unfortunately, the video CDN does not provide for white listing your site and limiting viewing from your domain only. Nevertheless, the provisioning of the video is fast and the service is integrated well with the media library. Apparently, the install process was trying to automatically install the VaultPress and Aksimet plugins, but it didn’t happen. What was a bit disconcerting was that there was no description telling me what was going on. I thought perhaps it was trying to take the initial backup and waited for a few minutes. When I contacted support they indicated that I could manually install the plugins if the process had stalled. I had no issues after I after doing that. There are no multiple site discounts for Jetpack, so that is why it only makes sense if you have one site. Other services have multiple site discounts and if you have multiple sites then this won’t be the most cost-effective route. I found the Premium version of Jetpack to be a viable alternative to an UpdraftPlus and iThemes Security Pro combination for people with just one website. 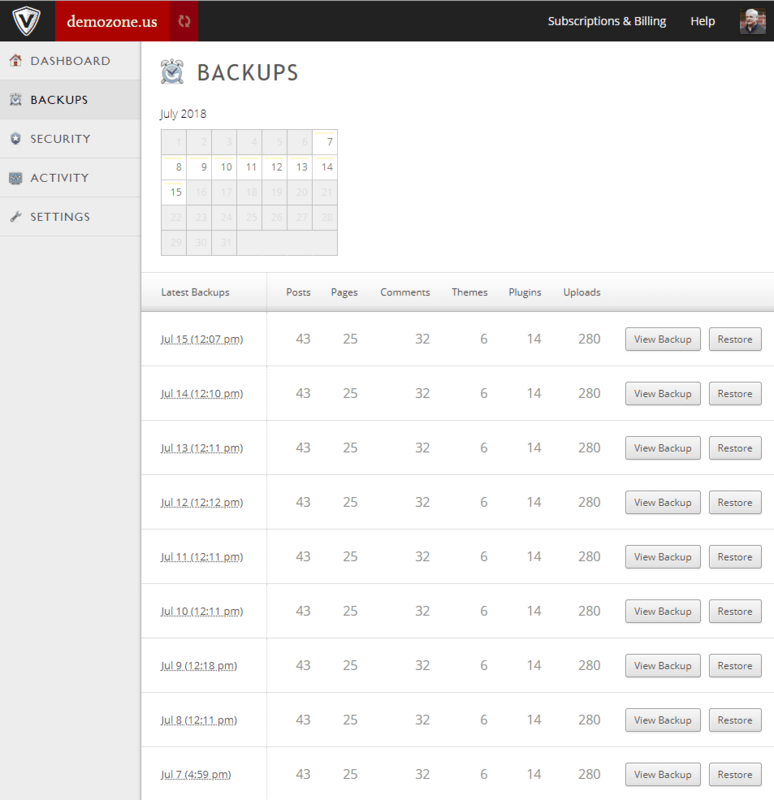 There is less flexibility in things like taking a backup on demand, but the settings are much simpler. If you are paying for the services so that you have support when you need it, then the very good support offered by the Jetpack team is an important plus. There are also many additional features that extend the vanilla WordPress experience, while the backup and security basics are covered. I think I would go for the Premium plan over the Personal plan because of the malware cleaning, video hosting, and social media features.